I adore the idea of photo books as gifts. It’s so personal and a way to make memories that last a lifetime. I know it’s a gift I love giving my Mom and my mother-in-law. There’s nothing else they love more than photos of their grandson. What I love most about a photo book, especially as a gift, is the stories you can tell. Whether it’s a book containing photos from your child’s first year, or their entire childhood… it’s a story that will be cherished for ever, because it can be passed from generation to generation. I getting ready to make a photo book chronicling my son’s plays he’s performed in. Oh, I have some great news for not one, but two of my readers! 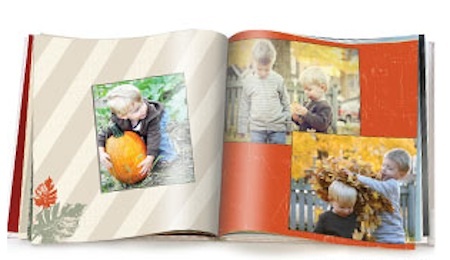 Shutterfly is giving away (2) 8×8, 20 page photo books! Nice! Open to US/CAN ~ Ends on December 12th at 11:59 pm EST. Shipping is not included. Enter on the Rafflecopter form below. Good luck! Disclosure: Blog by Donna did not receive monetary compensation. However, thank you to Shutterfly for providing me and two winners a complimentary photo book. Would love a photo book! They really do! I just made one for my son’s baptism, it’s just gorgeous! Going to see my grandparents when I was a kid. Definately baking with my grandmother during the holidays! Love those memories! It makes me remember visiting my grandparents when I was little! We went over to their house a lot because they only lived about 20 minutes from us! Making cookies is a big memory of mine!